The image shows a few small atypical glands adjacent to high-grade PIN. Some of them appear to connect to the larger PIN gland where as others appear detached. 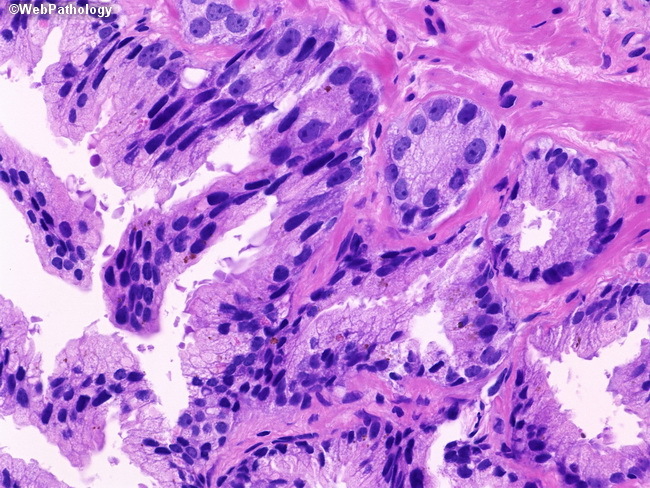 It is difficult to ascertain whether the small glands represent tangential section through outpouchings from PIN glands or a focus of cancer adjacent to high-grade PIN. Adenocarcinoma should be diagnosed only when the focus of atypical glands is sizeable or too far removed from the high-grade PIN glands.